When you step on the weighing scales and they don’t seem to be budging, it can be disheartening, leaving you feeling you’ve no reason to celebrate the efforts you’ve made that week and if you’re not careful you could be liable to throw in the towel and dive head first into a trough of biscuits! Qualifying your accomplishments and progress during your healthy lifestyle campaign only by what results you see on the weighing scales gives you a very narrow and limited focus and sometimes the scales reading does not reflect the active effort you may have made that week. 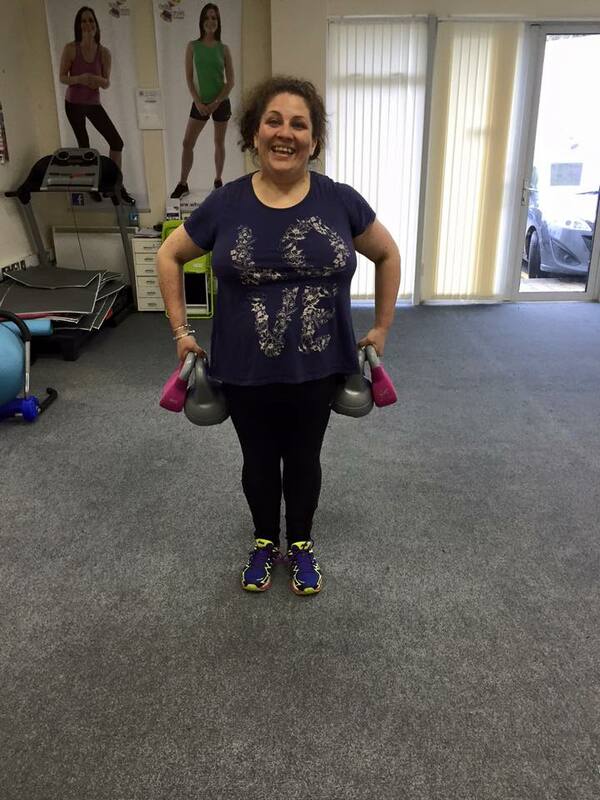 I had decided early on when I started making a conscious effort to lose my excess weight (again!) this year that every Sunday night I would make a list of non-scale victories before I even stood up on the scales on Monday morning so I started off every week with a positive and determined attitude, regardless of what the scales might show. 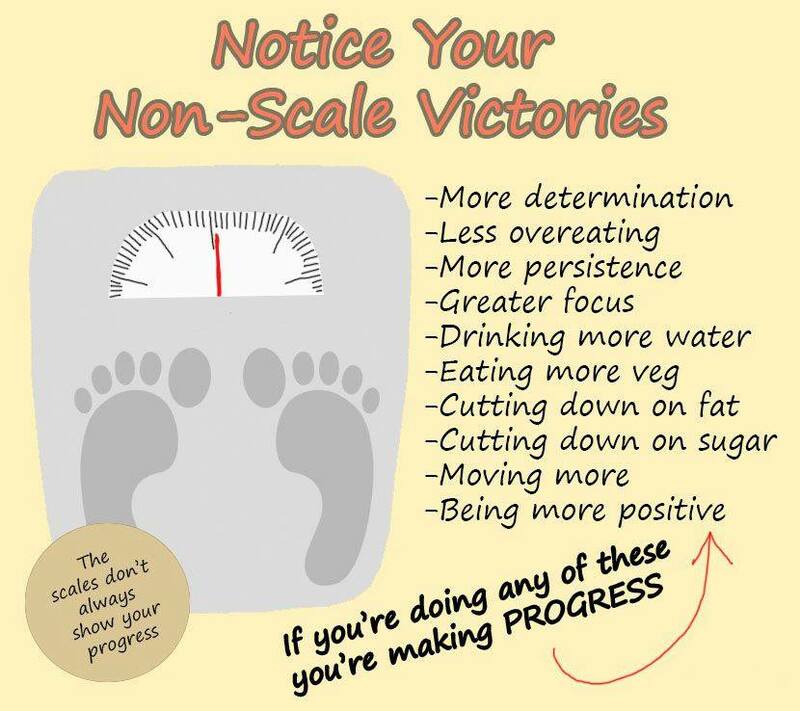 When you actually think about it you will have several non-scale victories to celebrate and acknowledge and over time these will build up. When you do this for yourself you can see the bigger picture of your weight loss journey and all the many ways you can record and bank results. 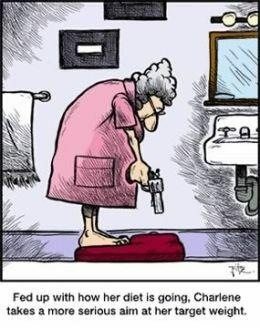 Your progress and successes are more than what you see on the scales. Over the last 6 months I’ve had fun learning to acknowledge and celebrate my non-scale victories which gave a much broader picture of where I was at but also helped me not take the scale results so seriously and deactivate any notion my inner critical voice may have had of chipping in with something useless to say to bring me down. Clothes are looser and fit better – Over time I noticed that my trousers were becoming looser and not cutting me in half any longer. After about a month of healthy and consistent weight loss I was on holidays by the sea and I discovered that I could step into my swimming costume and pull it up over my tummy and pull the straps on with no hassle. Gift! This was a massive surprise as I couldn’t see much difference in my appearance in the mirror but to feel how easy it had become to pull on the swimsuit was such a gratifying experience. Up until then it was a huffing and puffing ordeal to wrestle myself into it, having to jump up and down on the floor and wrestle in to it while rolling around on the bed LOL! Losing inches – I’m not one to measure my inch loss much but when I find my weight loss has slowed I will find that I am losing inches. 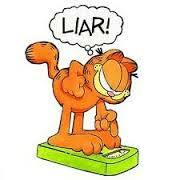 So far I have lost just under 10 inches from my waistline. Increased energy and better moods – my body is less drained and tired now that it is lugging much less weight around and I have way more energy during the day. I’m also less contrary! Easier to move – I find it much easier to climb stairs now and some days can take them two steps at a time. Before, I was under woeful pressure climbing stairs and my breath would be laboured once I’d reach the top. I’ve also noticed that there is now less back fat jiggling when I race up the stairs! 🙂 I can get up off the couch now no trouble whereas before I had to kind of launch myself at the edge and had to inch myself off. I wasn’t far off needing some kind of winching paddle! Tying shoelaces and putting on socks now is a doddle considering when I was bigger I had to kind of twist my foot up beside me to tie the laces as bending over to do it was cutting off my ability to breathe. I was sitting in my sister Emma’s last week and I came over all weird and became aware of a funny sensation and then I realised….. I could cross my legs!!!! A truly momentous occasion as it had been years since I could cross my legs at the knee. I was like a big child then and kept crossing and recrossing my legs for the next 10 minutes and jumped up to try it in different chairs LOL! Eating healthy nutritious meals and drinking more water – You need to nourish your body well to help lose weight and in turn maintain a healthy lifestyle. I like to try new foods and recipes which keeps my interest engaged so try to cook a new recipe at least once per week. I aim every day to reach and surpass the recommended daily minimum allowance of fruits and vegetables and the Why Weight Ireland Food Diary is great for showing me what percentage I have reached. I find it challenging to drink the recommended 2 litres of water every day so strive to reach it or get as close as I can. Increased fitness and endurance levels – When I started exercising again 6 months ago I was at my heaviest weight ever and could only run for 30 second intervals with a few minutes walk in between. As the weeks and months passed, with discipline and getting on out there, I increased my endurance levels and was able to run for longer and longer and only a few weeks ago I ran a 5km race non-stop in just over 45 minutes. Progress is progress no matter how slow and always a reason to celebrate! Collar bone and jaw line emerging – I quite fancied a while back that my collar bone was finally making an appearance but wasn’t quite sure, maybe it was just a shadow. This week though at a resistance workout with Hannah in the studio I could clearly see in the mirrors that they are definitely revealing themselves and my jaw line is coming along nicely. Stomach is getting smaller – One of the main glories of my stomach shrinking in size is that the steering wheel of the car is no longer wedged between Tummy One and Tummy Two! Now, there’s no power steering in my car but there is some difference now that the wheel is no longer wedged in my stomach and I’ve short hobbit-like legs and feet so couldn’t move the seat back any further or I wouldn’t have reached the peddles! I nearly cried in the bed one night lately when lying on my back I realised that my stomach was actually up on top of my body where it should be and not lying on the bed beside me where it had tended to droop the last few years. That’s no mean feat to have both your back AND your stomach lying on the mattress at the same time but after two pregnancies and being morbidly obese my stomach was humongous and had a life of it’s own. Thankfully it is now slowly shrinking back into place and that is a most gratifying non-scale victory to celebrate. A non-scale victory that you choose to celebrate and own for yourself can make a massive positive impact on your mood and self-confidence and I have found this crucial in helping maintain a healthy and balanced mind-set with regard to my progress. My beautiful life is so much more than what I see on the scales and to honour and celebrate every single non-scale victory in my life gifts to me tremendous fuel and inspiration to keep going and never ever give up. Please find below more recipes that I love of meals that are delicious, nutritious and help keep me on track. Who doesn’t love a good bacon and egg sandwich?! My friend Lorraine introduced me to these gorgeous slim bagels from Country Kitchen at only 120 each (instead of 230 calories for the full sized bagel) and I love coming up with new and tasty fillings for them. 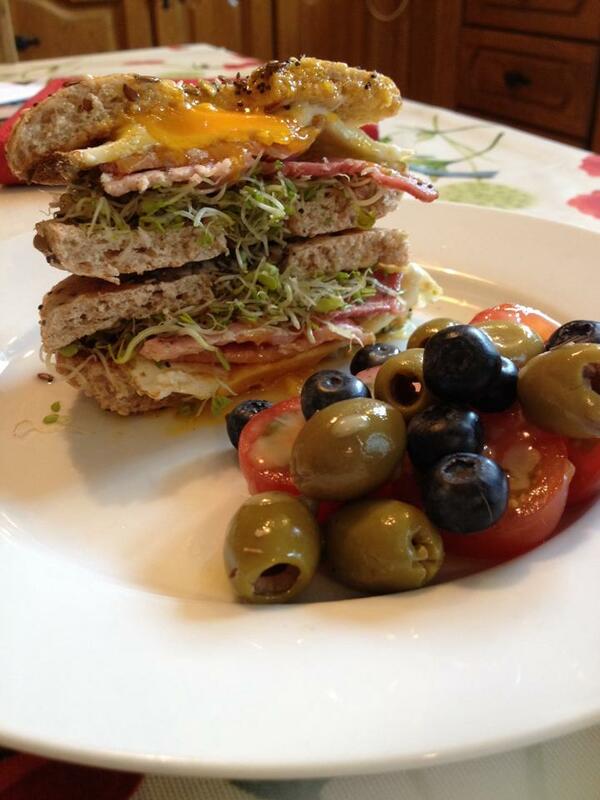 This smoked bacon and runny egg sambo with super sprouts are a winning combination for me, served up with delicious tomatoes, green olives and blueberries on the side. The sandwich alone is 267 calories. The whole dish plated above is 361 calories. Enjoy! Grill the smoked bacon rashers. Cook the egg in a pan with Fry Light. I don’t flip my egg and just finish it under the grill so the yolk doesn’t burst. Place the super sprouts on the bottom half of the bagel, followed by the garlic mayonnaise, then the grilled smoked bacon and top with the fried egg. Serve with halved cherry tomatoes, blueberries and green olives drizzled with the tarragon dressing. I love avocados and this is one of my favourite ways to enjoy it. I usually try buy smaller fruit just to keep the calories down but still enjoying the taste and benefiting from all the powerful nutrition. I would usually remove the visible fat from the Parma ham. This dip served with the vegetables alone is 307 calories. The addition of one slice of buttermilk soda bread and scraping of butter brings the total to 437 calories. Enjoy! Slice the avocado length-ways, taking care for the hard stone within. Split in half and remove the stone. Remove the flesh using a dessert spoon and mash in a bowl together with the honey and mustard dressing. 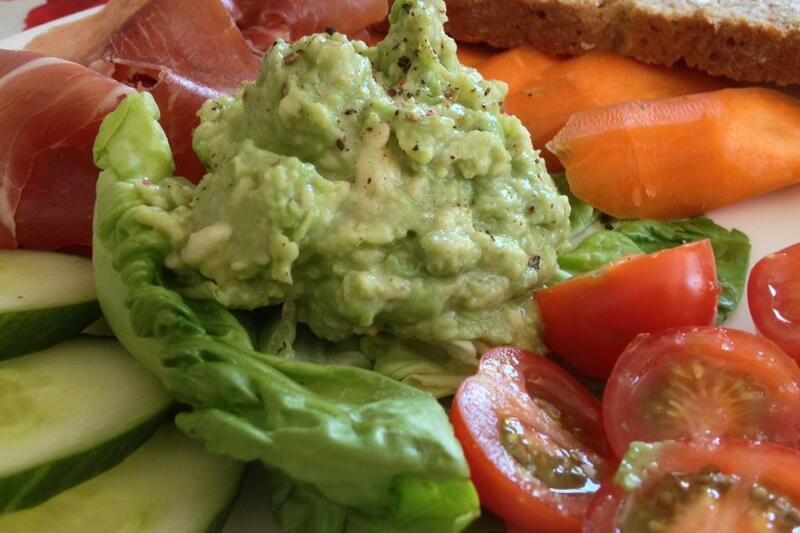 Display your tomatoes, gem lettuce, Parma ham, sliced carrot and cucumber on a plate and spoon the avocado dip into the middle. Freshly grind some black pepper on top and serve with the soda bread and butter.